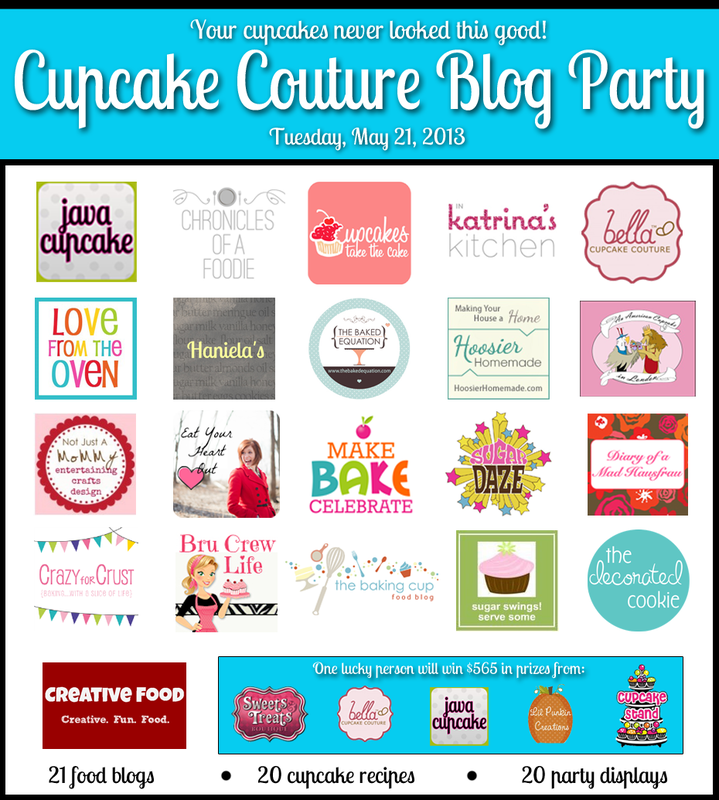 It's a Cupcake Couture Blog Party y'all! 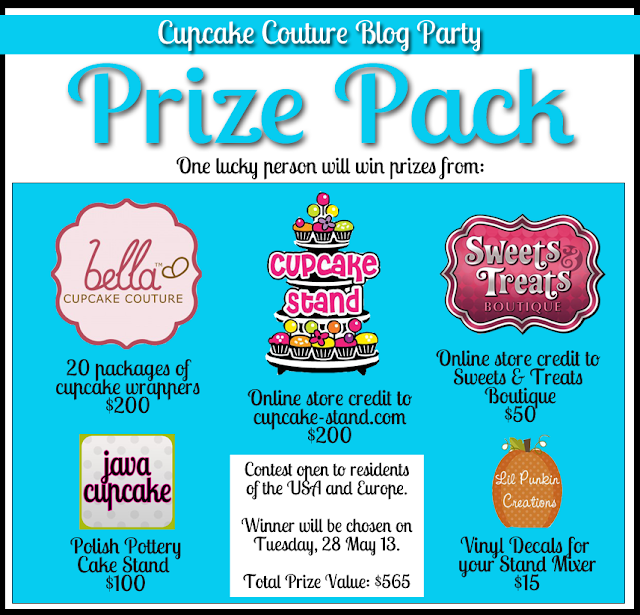 We were invited by Betsy Eves of Java Cupcake to participate in this wonderful Cupcake Couture Blog Party and giveaway along with 20 other food bloggers. How cool is that?! You can find all the participating bloggers' recipes below...that's 20 new cupcake recipes! All the participating bloggers were sent a beautiful set of cupcake wrappers by Bella Cupcake Couture and were asked to create a recipe to match our assigned wrappers. I received the "Hannah" wrappers, which features a fabulous pink and citrus floral pattern. I was racking my brain for a couple weeks trying to figure out what would go with such a vibrant print, all I could think about was what cupcake would be pink and orange. 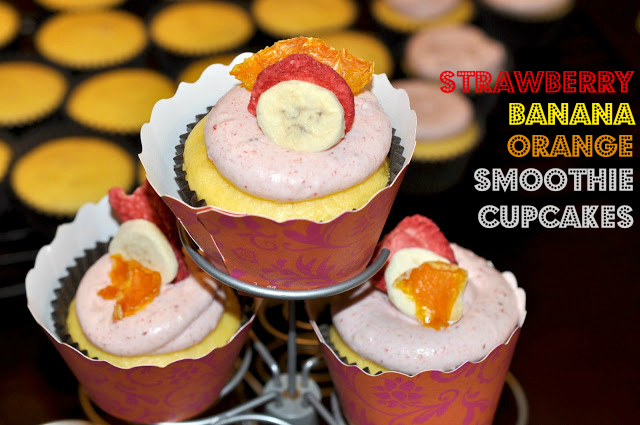 Eventually I started playing with the idea of strawberries and orange and somehow it turned into an experiment into recreating a smoothie as a cupcake! I'm tempted to call these diet cupcakes. Or at least semi diet. Definitely semi-homemade though. I used a yellow cake mix and mixed it with Orange Juice, Orange Creme Light Yoplait Yogurt, Eggs and added some powdered freeze dried Orange Slices. That's it! No butter or oil or water! So it's totally diet friendly, I mean, I used LIGHT yogurt for crying out loud. As you can tell, I'm trying to achieve an orange flavored cupcake, but the frosting definitely takes this cupcake into the smoothie side of the world. I used Duncan Hines Frosting Creations Frosting Starter just so I could have a neutral flavor base for the frosting. You can go Vanilla or Cream Cheese but I was trying to avoid making the frosting too sweet. 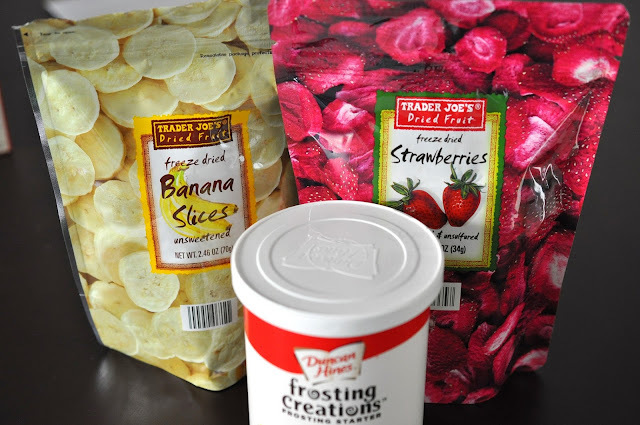 Instead of using the flavor packet companion to the Frosting Creations I used freeze dried strawberries and bananas that I got at Trader Joes. I figured I could throw them in the food processor and make my own flavor powder made out of real fruit. Using the freeze dried fruits instead of fresh fruit makes it easier to incorporate the flavors into the frosting without compromising its integrity. When you add too many "wet" components into a frosting you need to counteract it by adding more powdered sugar to thicken it back up. Then it turns into a balancing game of adding wet and dry until you get the consistency you want, but end up with a frosting that is way too sweet! I threw the fruits into a food processor until they were a fine powder and I beat it into the can of frosting until everything was combined. Even though I used freeze dried fruits, I still had that fresh fruit feel to the frosting, like being able to see the strawberry seeds and get the crunchy little texture from them. I think all the colors of the cupcake ended up matching the wrapper quite nicely! All the flavors went well together too, the orange cake with the strawberry banana frosting reminded me of the good ol' days sipping on an Orange Julius at the mall. I still think it's safe to call these semi-diet cupcakes. I even topped them with a trio of freeze dried fruits! 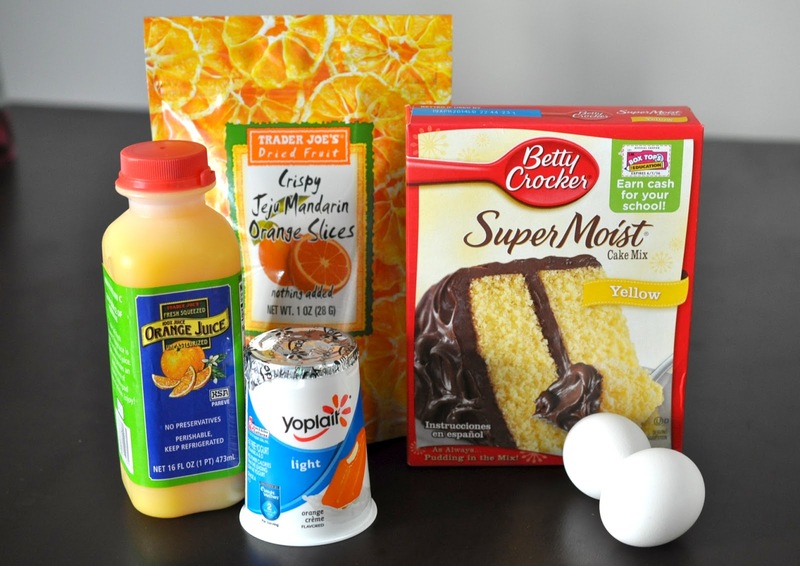 Beat cake mix, yogurt, orange juice and eggs on low for 30 seconds. Increase speed to medium high for 1 minute. Cut up or throw the freeze dried oranges in a food processor. Add to batter and beat for another minute. 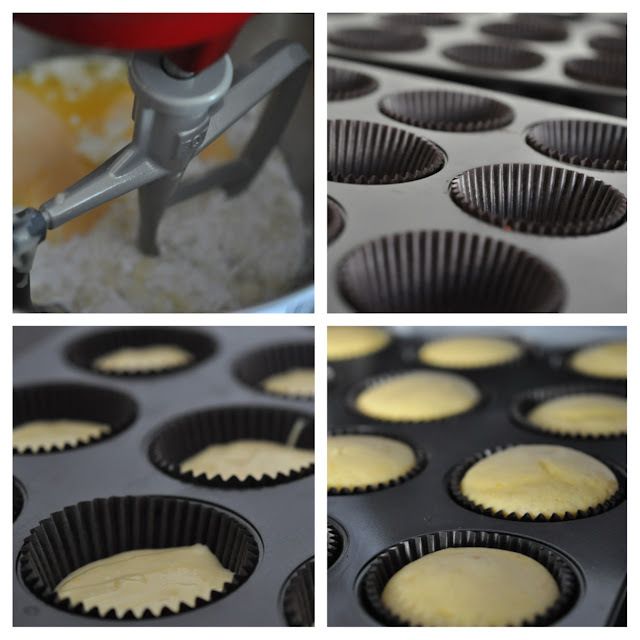 Line cupcake pan with liners. Fill liners 2/3 full with batter. Bake for 15-18 minutes or until a toothpick inserted in the middle comes out clean. Empty frosting container into mixing bowl. 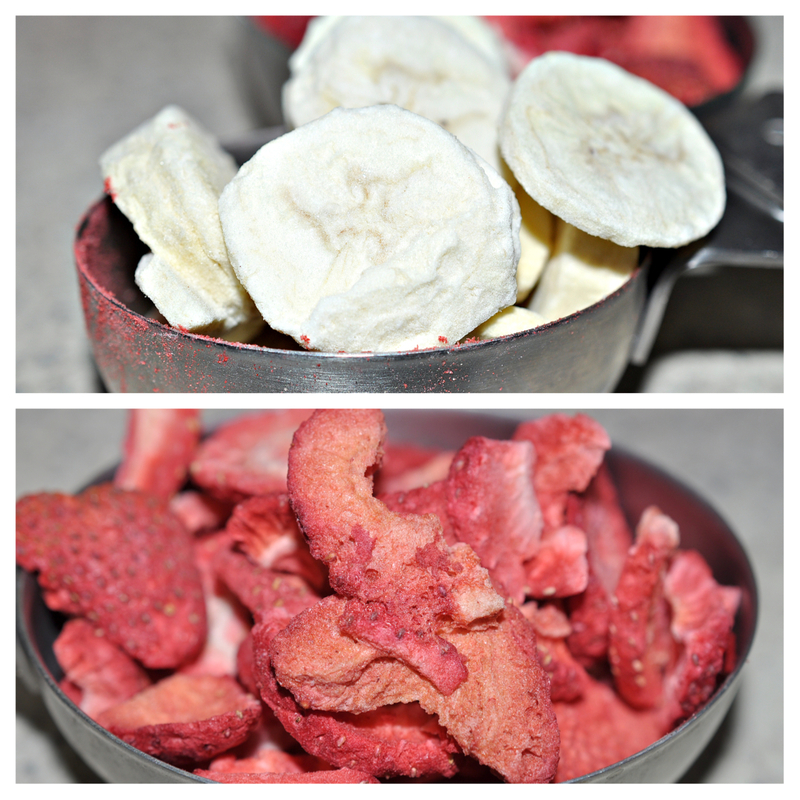 Add strawberries and bananas to food processor and pulse until both fruits are ground into a fine powder. Add combined powder to frosting and beat on low for 1-2 minutes until strawberries and bananas are incorporated into the frosting. Taste to make sure it tastes as fruity as you'd like, if not, continue to add more strawberries and bananas 1/4 cup at a time. To enter to WIN this Prize Pack, simply fill out the entry form below. Contest opens May 21, 2013 at 7:00 PST and closes May 27, 2013 at 11:59PM PST. One winner will be chosen and announced within 24 hours of the contest ending. Winner will be contacted via email to claim their prize. This contest is open to residents of the USA and Europe only. Love your fresh fruit decoration on top. Beautiful colors on those wrappers! The Hannah wrappers are adorable! Love the fruit on top! What a great idea to use the fruit on top! LOVE IT! I love how you made your own frosting creations! And all the orange in the cupcake - yum! Wow! What a great recipe and pictures, I feel like I can smell them! Lol! Great job! Seriously I didn't even need to see these cupcakes, once I read your title I was ready to eat the screen, sounds so delicious and they look beautiful. Thanks for sharing. I really like the Winter Cupcake Wrappers. Fun! Great tropical flavor combo. If only I were on the beach with one of those! I love the Cupcake Wrappers in Birthday Party Hats, they're adorable! love trader joes freeze dried fruits, great idea for icing, and i love those wrappers!! fun! I like the snowman cupcake wrappers! I love your fruity creative recipe. The wrappers are adorable! Hope to win! "All work and no play makes mommy a disgruntled chick." I love ur cupcake and the wrappers r gorgeous. I love these! 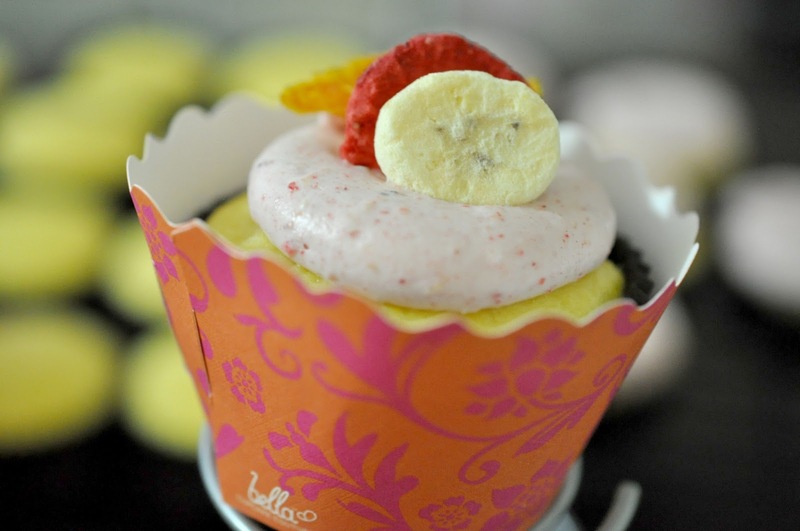 Any cupcake that I can call healthy is a friend of mine ;) I oove the idea of using freeze dried fruit too, good call! Love the wrappers, they are so pretty. I LOVE how you made a unique cupcake even using a box mix and canned frosting. It shows how easy it can be to make a cupcake still feel a bit like it's from scratch. And you made it diet friendly even better. And it matches the cupcake wrapper too.....yes you pretty much knocked the cupcake out of the park. Beautifully done! Thanks for participating! Going to have to try these something...it's fruit so it's totally healthy right? :) Great job! Those look and sound fab!! !